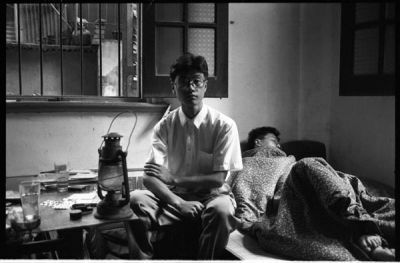 Lu Yuanming, Shanghainese, 1990, Courtesy of the artist. The role of the arts becomes ever-important as artists look to interpret the experience of inhabiting a city and a time that is in the process of defining itself. Reversed Images is divided into three thematic areas. The first looks at the romantic notions of Shanghai’s past and how it flourished as a center of commerce for trade between the East and West—represented by the illusion of Shi Guorui’s large-scale camera obscura photograph. It also examines the city’s shift from the past to its development into a hyper-modern city. 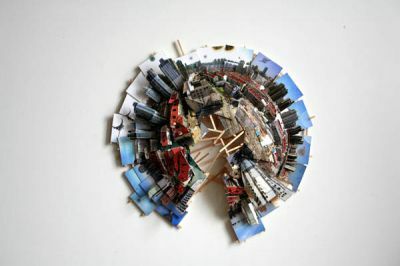 This theme is represented in the exhibition’s sub-sections: Upside Down/Progressing and Glorifying the City Present/Future. The second theme, titled Artist: Urban Comments, explores how Chinese artists are interpreting their role in Shanghai, living within a contradictory environment that imposes limitations while also producing an extraordinary stage for artistic exploration and visual/conceptual research. The third section, simply called Interiors, describes the secret spaces and unexpected privacy in a city of eighteen million people. The exhibition includes architects, urban planners, and graphic designers, as well as artists using photography. Shanghai during the roaring 1920s and ’30s still conjures a city of sin and forbidden pleasures—the mythical Paris of the East. Serving as a prelude and comment for the rest of the exhibition, Shi Guorui’s (China, b. 1964) large-scale panoramic camera obscura image of Shanghai captures both the historic Bund, the old colonial power, on one side of the Huanpujiamg River, and Pudong, the symbol of China’s economic boom, across the river. Created by turning a hotel conference room into a camera, Shi’s photograph is a reversed negative image of a city dealing with its past, present, and future. The image invites the viewer into a game played throughout the exhibition evoking the question: what is real and what is fiction? The works in this section illustrate Shanghai’s rapid expansion and modernization in the last twenty years and question the perceptions and social implications of a quickly disappearing past and a futuristic present. During the 1970s and ’80s Xu Xixian(China, b. 1942) traveled around Shanghai on the weekends with his young son taking photographs of the landscape. Twenty years later the son, Xu Jianrong (China, b. 1969), began to revisit the now drastically changed locations of his father’s original images, and together they have created a before-and-after portrait of the city. Using an approach more sociological than artistic, their project informs a complex structure of references to the recent past and the already rapidly changing present. Shooting from a helicopter with a tilt-shift lens camera, Olivo Barbieri (Italy, b. 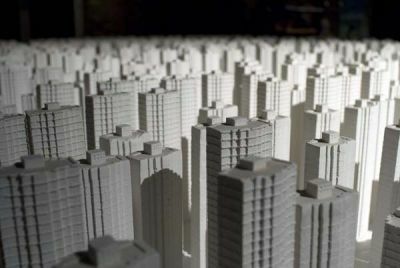 1954) produces selectively focused images that make his urban scenes look like accurate, miniature models. By blurring imperfections and distorting the scale of buildings and people, Barbieri redefines the customary ground-level perspective, creating an urban landscape that to the viewer appears artificial. His work in this exhibition is a surreal vision of Shanghai’s highways at night that juxtaposes the beauty of modernism with contemporary functionalism. Isidro Blasco (Spain, b. 1962) combines architecture, photography, and installation to explore themes of vision and perception in relation to physical experience. Within each sculpture, the viewer is encouraged to become an active participant by interacting within these habitat-like structures that directly mimic similar aesthetics and perspectives found elsewhere in the city. Zhu Feng (China, b. 1974) is fascinated with the makeshift sculptures found randomly on worksites constructed of shipping containers, garbage, removed earth, and detritus. Zhou Xiaohu’s (China, b. 1960) realistic but digitally fabricated photographs describe building sites in the process of being demolished that are surrounded by contemporary architecture. In each image he creates a visual labyrinth of fictional drama. For David Cotterrell’s (United Kingdom, b. 1974)South Facing, a 2005 installation, he has produced an entire city of filler blocks—750 miniature towers—that echo China’s dictate that each new building be at least 15 degrees south-facing, reflecting the emperor’s palaces in which private quarters faced south and the less valued courtiers’ rooms faced east or west. A single spotlight illuminates this overwhelming installation, creating the aura of a silent funerary monument. Su Chang’s (China, b. 1985) mixed-media installation Ruins, 2008, includes a perfect copy of a particular building in Shanghai that was demolished. It represents one of the many buildings that are disappearing from the city’s older neighborhoods, razed to make room for the new city. The proximity of this model to the works by Zhou Xiaohu and David Cotterrell creates a paradox of the real (what does exist) versus the unreal (what has disappeared)—the present versus the past. Jin Shan’s (China, b. 1977) interactive work Build a home for yourself, building for Shanghai, 2005, is a positive representation of the dreams of individuals and refers to the building rush in Shanghai. Within the work the viewer is encouraged to construct his or her ideal home out of wooden building blocks placed on a light table underneath a tent-like structure familiarly used by builders in China. It is a poetic gift for individuals who do not have the actual power to do what the work allows. Birdhead (artist collaborative Song Tao and Ji Weiyu, China, b. 1979 and 1980) offer a direct representation of Shanghai as they nonchalantly capture their neighborhood being demolished to build the 2010 Expo site. Presented in a book, their work is a mixture of carefully composed and casual snapshots taken with a variety of cameras. The thick book, highly inspired by Nobuyoshi Araki’s 2001 book Hardcover, is an extensive accumulative photographic series that delivers a subjective and raw take on urban reality today, a living testament to a generation’s existential bewilderment. The glorification of the city is everywhere in Shanghai: plastered to construction sites, on radio, television, and Internet sites, and in periodicals. The glorification of the city is everywhere in Shanghai: plastered to construction sites, on radio, television, and Internet sites, and in periodicals. Liu Gang’s (China, b. 1983) Paper Dream series, 2008 mirrors the real-estate advertisements stretched over scaffolding that typically market a new form of urban living in China. 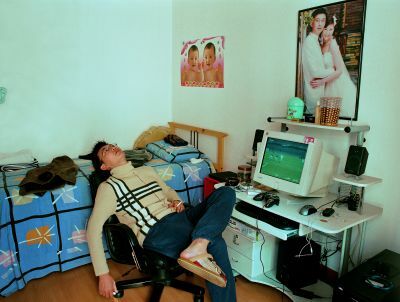 These works bear witness to the rise of a new class of Chinese citizens defined by a rapid social mobility that provokes new anxiety about personal tastes and the need to conform to the trappings of a particular social status. Working in the field of architecture, visual arts, urbanism, and scriptwriting,Speedism (artist collaborative Julian Friedauer and Pieterjan Ginckels, Germany, b. 1980, and Belgium, b. 1982) develop visual universes through the use of 3-D animation rendering different forms of material focused on mythology, urbanism, and geopolitics. By randomly mixing the materials together as if visual DJs, their work becomes collages of information giving rise to diverse points of departure but never with a concrete conclusion. Their work in China reflects the way in which a city’s multilayered realities can clash. As a counter canto, Cao Fei’s (China, b. 1978) RMB City, 2009, is an art community in the 3-D virtual world of Second Life, an online platform where participants create a parallel reality in which to live out their dreams. Within Second Life Cao Fei has constructed a virtual city that will continue to grow and change over its two-year run with the participation and support of leading international art institutions and creative practitioners. The project explores the potential of an online art community, seeking to create the conditions for an expansive discourse about art, urbanism, economy, imagination, and freedom. This particular video presents the making of RMBcity, within a few minutes the viewer witnesses the genesis of the future city that, symbolically, can retrace some of the chaos of Shanghai’s present and future. This section focuses on the role of the artist in contemporary Shanghai and includes Yang Fudong’s (China, b. 1971) The First Intellectual, 2000, the first image in his series The Seven Intellectuals adapted from the traditional Chinese stories known asThe Seven Sages of the Bamboo Grove. This series explores the ambiguous position of intellectuals in contemporary China and their longing for individual freedom in the shifting context of an emerging capitalist economy. As Yang Fudong has stated about the work, “you can see that ‘the first intellectual’ has been wounded. He has blood running down his face and wants to respond, but he doesn’t know at whom he should throw his brick; he doesn’t know if the problem stems from himself or society.” The multimedia piece titled 40+4: Art is not enough! Not Enough! The Making of the Arts in Shanghai 1980s-2008, Artists Interviews attempts to answer Yang’s existential question with a series of interviews with Shanghai-based artists of various generations. This multimedia installation presents a cross section of the Shanghai art scene and probes each artist’s relationship between their work and the evolution of contemporary art in Shanghai. content. Zhang Qing’s (China b. 1977) works are always irreverent and dissociated from linear thinking. In the work presented here the artist plays with the unbearably small size of Shanghainese apartments and turns them into soccer playgrounds where youngsters have fun. The video and stills are gracefully composed and create a lyric request for air and freedom. contradictions of daily life in Shanghai. All cities find themselves between a celebrated past and a dynamic present that demands rejuvenation. All cities find themselves between a celebrated past and a dynamic present that demands rejuvenation. If they stop too long to preserve what is unique and beautiful the world passes them by. If they destroy themselves too rapidly, they run the risk of losing their hard-earned, long-term identity. The artists in this exhibition explore the metaphoric possibilities of this dilemma within Shanghai—and themselves.